The Pretorian Trust was established in 1975 as a Public Benefit Organisation with the sole objective of receiving funds donated to Pretoria Boys High School. Donors are able to receive a Section 18A tax certificate enabling them to deduct this donation from their annual returns. These funds are disbursed to the School on an annual basis to be used for projects identified by the school. Through the efforts of the Pretorian Trust an amount of R32 million was raised to enable the School to undertake the biggest building project since the construction of the School itself, namely the refurbishment of the Abernethy Hall and the construction of the Bill Schroder Centre comprising a Library, Computer Facility and Music Block. The completion of this project allowed the School and the Trust to consider future projects.The two main projects currently are the provision of bursaries for deserving boys and the removal and reconstruction of the prefab classrooms. To enable focused donation, two additional Trusts have been established to allow donors to specify where they want their donation to be spent, hence the Bursary Fund and the Endowment Fund. The Bursary Fund is one of the beneficiaries of the Pretorian Trust. The central purpose of the Bursary Fund is to build exceptional leadership capacity in South Africa by making the dream of attending Pretoria Boys High School a reality for eligible male students who are in a position of financial need. Qualified students must also meet academic requirements and show that they would benefit from being at the School through the development of skills they may possess. Our mission is to provide a structure within which interested donors, wanting to make a difference, can assist boys from disadvantaged backgrounds by providing the financial means for them to attend Pretoria Boys High School and succeed in their education. The days of free quality education are long gone and annual fees are now between R 47 000 (day boys) and R 108 000 (boarders). The number of scholarship recipients the fund can support is directly dependent on the income the fund is able to generate. The long term sustainability of the fund is also dependent on whether capital can be generated that will make provision to finance a pupil for the full five years of his schooling or endow sufficient funding for one or more bursaries to be financed out of the proceeds of an investment. It is therefore vital that donors both large and small come to the fore to assist in this worthwhile project. As an added incentive the Pretorian Trust is registered with SARS and is authorised to issue Section 18A Tax Certificates. The Trust’s PBO number is 9300012694 and donors can get tax relief from their donation. The Bursary Fund strives to develop and grow the innate abilities of a young man who can reap the benefit of a superior high school education, enabling him to enter tertiary education and a career of his choice instead of one restricted by his original disadvantaged circumstances. The Deputy Headmaster in charge of bursaries initiates the selection process by approaching primary schools that serve disadvantaged communities in Gauteng. Of these academically talented Grade 7 boys, high achieving boys will be selected. Potential candidates may also apply from other sources or be referred to the School. A Selection Committee proposes candidates who are then approved by the Board of Trustees. The selected candidates are placed at Pretoria Boys High School, which has a strong tradition of Mathematics and Science teaching in particular, as well as a positive social/cultural lifestyle. Boys enter and are supported by the Fund at the beginning of their Grade 8 year and are sponsored until they complete Grade 12. Every boy is regularly monitored to ensure his educational and social needs are attended to. 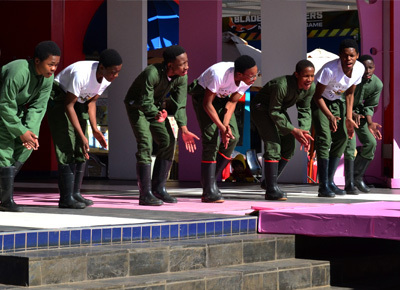 This ensures the development of a culture of learning in the boys and prepares each of them for tertiary education. Over time the intention is to build a strong relationship of trust, honesty and integrity amongst the Fund, the boys, the School community at large and the donors. Education plays a most important part in any person striving to achieve success. What makes this effort unique is that every boy is sponsored for the duration of his/her high school career by people who want to make a difference. Sponsors, if they so wish, will be able to follow the progress of the individual boy. 100% of your donation is spent directly on the boys. All administration costs of the Trust will be covered by other sources. The structure of the Trust is such that donors are able to seek tax relief for a portion of their taxable earnings. If you would like to become involved and feel you want to help make a difference in the lives of South Africa’s youth by making a financial commitment to The Bursary Fund, please click on one of the options on our “Donate Now” page. Various options are available to donors from funding stationery and uniform to providing school and/or boarding fees for him. Donations can be either in lump sums or on a monthly debit order. The challenge posed by Boys High’s extensive facilities lies in the need to maintain these in the absence of significant state assistance. The School faces unique problems in this regard, not only because of the scale of the infrastructure, but also because of the age of the original buildings which are over a century old and are National Monuments. The School Gym ideally needs to be converted into an indoor sports centre. At present the gym is utilized only by the School’s climbing, fencing and table tennis clubs, but it’s upgrading would greatly expand its usefulness for a number of other sporting codes, thereby benefiting the greatest number of sportsmen. Pretoria Boys High School currently has 38 asbestos prefabricated classrooms dating back many years. This is not ideal from an aesthetic as well as a health and safety aspect. We would like to convert these classrooms to brick structures. Naming rights for certain buildings will be considered for substantial donations and are subject to negotiation. If you would like to become involved and feel you want to help make a difference in the lives of South Africa’s youth by making a financial commitment to The Endowment Fund, please click on one of the options on our “Donate Now” page. Various options are available and donations can be either in lump sums or on a monthly debit order.